Laboratory diagnosis of malaria in South Africa has traditionally relied on microscopic examination of stained blood films. More recently, rapid diagnostic tests (RDTs) have been introduced into routine use, and molecular methods like polymerase chain reaction are useful in certain situations. As with all laboratory tests, each technique has its advantages and disadvantages. Microscopy and RDTs, if appropriately quality assured, are adequate for clinical case management. For elimination, active surveillance will need to be expanded substantially, with wider use of more sensitive diagnostic nucleic acid amplification techniques, and/or serology. To facilitate surveillance activities, techniques suitable for field or near-field use would be ideal. A long-running external quality assessment programme in South Africa has shown some deficiencies in the quality of malaria diagnosis in routine laboratories. Quality systems across the spectrum of diagnostic facilities in South Africa need strengthening, to ensure progress towards elimination. Microscopic examination of Giemsa-stained films is still the operational gold standard for diagnosis of clinical malaria, albeit one widely acknowledged as imperfect. The sensitivity of thick blood film examination is limited by the training, skill and experience of the microscopist, the quality of the smear preparation and staining, and the level of the parasitaemia. As few as 5 - 50 parasites/µl can be detected by an expert, but many microscopists do not meet this standard. There are inherent technical problems that have long been recognised, such as parasites washing off during the thick film staining procedure (an estimated 60 - 90% of parasites are lost). Quantitative polymerase chain reaction (qPCR) has been used to measure this reduction (around 1 log i.e. 10 times) in parasite density. Microscopy equipment quality and maintenance, and staining quality and technique are often suboptimal, especially in remote, poorly-resourced settings. Quality of microscopic diagnosis can be highly variable. A study in a Mpumalanga Province malaria-risk area showed wide variation in positivity rates (6.3 - 45.8%) of a set of 48 slides that was circulated among four diagnostic laboratories. In contrast, a legacy slide rechecking programme involving dedicated malaria programme microscopists in Limpopo Province claimed a 99.4% accuracy rate. Delays in hospital laboratory diagnosis were found during a review of malaria-related deaths in Mpumalanga Province. The present situation regarding quality assessment (QA) of blood film microscopy for case management in diagnostic laboratories is discussed later. HIV has a detrimental effect on malaria disease recognition and management, and this has been documented in the course of confidential enquiries into malaria-related deaths in SA. The clinical threshold for malaria testing should be lowered in HIV-positive patients who present with fever in endemic areas. Previously, the SA provincial malaria control programmes undertook extensive active surveillance (case detection) in endemic areas, with control personnel sampling communities in which they were working at the time (P Kruger, personal communication). In many insecticide-sprayed areas, prevalence has dropped to such low levels that this is no longer widely done, and the inadequate sensitivity of microscopy or rapid diagnostic tests (RDTs) constrains their usefulness. The fact that malaria case investigators conducting active field surveillance cannot dispense the first-line antimalarial drug artemether-lumefantrine (as they could previously, when chloroquine fulfilled this role) has removed the motivation for on-site diagnosis and treatment. With better access to primary healthcare facilities than previously, most suspected cases are referred to the nearest clinic, where RDTs are generally available. If elimination is to be achieved, active surveillance practices will probably need to be revived and expanded to detect a sufficiently large enough pool of low-level infections to influence transmission. A corresponding move towards more sensitive detection methods will be required to detect the generally lower parasite loads expected. A suitable alternative to microscopy in resource-deficient areas is the malaria RDT as it is relativity simple to perform, while allowing for point-of-care diagnosis and immediate malaria treatment. [18,19] Malaria RDTs are lateral flow cassette-based immunochromatographic tests that detect specific Plasmodium antigens circulating in the peripheral blood of malaria-infected individuals. The binding of one of these antigens to dye-labelled antibodies results in the development of a visible coloured band in the test window of the RDT nitrocellulose strip, confirming the presence of malaria antigens. Sensitivity, specificity, stability and cost of a malaria RDT is greatly influenced by the choice of target antigen. Inherent disadvantages of RDTs for clinical case management are their inability to quantitate the parasite load and to track parasitological response to treatment. In response to delayed as well as substandard malaria microscopic diagnosis, the National Department of Health (NDoH) became the first African health ministry to implement a definitive malaria diagnosis policy using RDTs at all public sector health facilities in 1996. An RDT targeting the P. falciparum histidine-rich protein 2 (HRP2) was deployed, as P. falciparum infections accounted for over 90% of all confirmed malaria cases. Field trials demonstrating a high degree of sensitivity and specificity, together with RDT user-friendliness, led to rapid acceptance of HRP2-based RDTs in the malaria endemic regions. More efficient case management of non-malaria febrile patients and a more rational use of antimalarials in both Mpumalanga and Limpopo provinces followed RDT roll-out, a trend observed in other African countries. [24-27] Unlike the other two malaria endemic provinces, RDT introduction in KwaZulu-Natal Province was associated with an increase in both case numbers and drug use. These increases were most likely fuelled by the emergence of sulphadoxine-pyrimethamine-resistant parasite populations in the region. Following a drug policy change in 2001, RDTs ensured appropriate use of expensive artemisinin-based combination therapies and effective case management of non-malaria febrile cases in KwaZulu-Natal Province as well. Since the initial deployment of RDTs in 1996, the parasite species structure has not altered substantially; with falciparum infections still the most prevalent in SA. In addition, field evaluations of HRP2-based RDTs demonstrated a sustained high level of sensitivity with a marginal decline in specificity, suggesting HRP2-based RDTs are still a viable option in SA. A survey of 102 public-sector laboratories in 2008 showed that 90 (88%) were routinely using RDTs; this was up from 74% (85/115) in 2002, and almost the same proportion (131/147, 89%) were using them in 2013, reflecting the present fairly stable malaria situation in the country (National Institute for Communicable Diseases (NICD) data, unpublished). Investigation of malaria-related deaths suggested that in private medical practices, RDTs appear to be underused, and that education and training are required in diagnostic as well as other aspects of malaria case management in this sector. Although RDTs have proven to be extremely cost-effective in sub-Saharan Africa, their usefulness on the continent is sometimes constrained by sensitivity and specificity issues. Typical parasite loads in eliminating areas are expected to fall well below 100 parasites/µl of blood, the approximate detection limit of RDTs, fuelling calls for the development and use of more sensitive nucleic acid-based techniques. This need, particularly in eliminating areas, is further highlighted when the HPR2-based RDT false-positivity rate is considered. Following successful malaria treatment, the HRP2 antigen persists in patients' blood for prolonged periods, resulting in false positives. There are also operator- and intrinsic test-related reasons for false positives. In a low-prevalence environment, this can translate into a very poor positive predictive value, an over-estimation of malaria incidence and over-prescription of artemisinin-containing combination treatments (ACTs), and increased drug pressure. The replacement of HRP2-based RDTs with those targeting the P. falciparum lactate dehydrogenase (pfLDH) antigen will not necessarily alleviate the false-positive issue. As both malaria gametocytes and asexual parasites produce pfLDH, a RDT test may appear positive despite the clearance of symptom-causing asexual parasites. Sensitivity of HRP2-based RDTs can be further comprised by genetic modifications in the HRP2 gene. Sequence variations and deletions in the HRP2 and HRP3 genes affect HRP2-based RDT sensitivity, most often resulting in false-negative results. At present these variations are relatively rare in Africa, but routine surveillance for these mutations is recommended to ensure RDT efficacy is sustained. QA of RDT usage has lagged behind deployment in SA and there is currently no comprehensive quality-monitoring programme. Production lot variation and stability problems are known to occur,[34,35] but at user level, routine quality control (QC) and proficiency testing (PT) are long-standing deficiencies. A study of proficiency among end-users of RDTs at primary healthcare level in Limpopo Province showed many problems of technique and interpretation, including false-positive and -negative rates of 4% and 15%, respectively. A comprehensive quality programme would include regular QA/ QC of negative and positive RDTs from all health facilities using sensitive molecular methods like pooled PCR; batch testing of RDTs at a designated reference laboratory, prior to the delivery of RDTs to de-centralised health facilities, to ensure the minimum sensitivity and specificity is attained; regular refresher training on administering and interpreting RDT outcomes; and regular assessment of RDT transport and storage conditions at decentralised health facilities. Availability of positive control antigen material, long delayed because of technical production difficulties, appears to be imminent, and will help greatly in QA of RDTs and users. 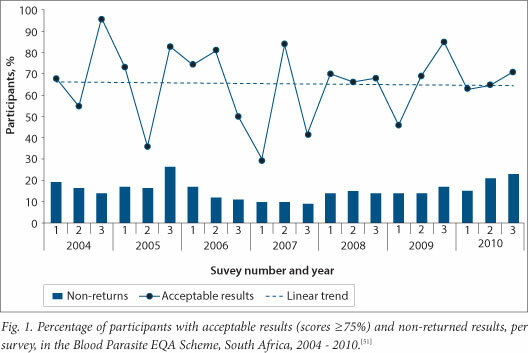 As an interim measure, PT using simulated samples (P. falciparum in vitro culture medium) has been successfully trialled in routine laboratories in SA as part of an external QA programme (discussed later), but historically, malaria control programme personnel have not participated in this PT scheme. Microscopy and RDTs, when performed and interpreted optimally, are suitable for case management and in the local context will need attention to quality improvement, maintenance and support, as discussed later. As SA embarks on its elimination agenda, mass screening and treating sufficient numbers of malaria carriers, whether symptomatic or asymptomatic, to interrupt malaria transmission becomes imperative. Detecting and eradicating every parasite, both asexual stages and gametocytes, using detection methods more sensitive to low-density infections, such as nucleic acid-based technologies,[17,38] is therefore essential. Specificity of these methods also needs to be high to avoid false-positive results. Various suitable versions of DNA amplification, such as conventional and real-time qPCR, are readily available or already in use in the public and private sectors. PCR can also be used to monitor field RDT diagnostic quality. Loop-mediated isothermal amplification (LAMP) has potential field use, as technical requirements are much reduced in comparison with PCR. While an earlier version targeting ribosomal sequences was not very sensitive (detecting 100 parasites/µl), performance characteristics of the latest formulation are comparable with nested PCR for clinical malaria diagnosis.A preliminary field trial in Uganda showed good sensitivity and specificity in comparison with PCR for low-density infections. The technology is clearly potentially attractive for this purpose. Very low levels of parasites are frequently or routinely missed by microscopy even under optimum conditions. As detecting and eradicating transmission foci are fundamental to malaria elimination, appropriate public sector laboratories should consider adopting techniques capable of identifying low-level gametocytaemia. A real-time quantitative nucleic acid sequence-based amplification (QT-NASBA) assay has been used successfully in Africa to determine sub-microscopic gametocyte carriage, but requires the collection of whole blood. In contrast, a reverse transcription PCR (RT-PCR) method can successfully conducted on fingerprick filter paper blood samples. An indirect approach to detecting malaria exposure is serological testing to detect parasite-specific antibodies. This technique has been used successfully in Somalia and Tanzania to determine malaria exposure and changes in transmission intensity. If SA is to meet its elimination target, then malaria confirmation using one of these more sensitive methods must become standard procedure at appropriate public sector laboratories. This will allow for more precise malaria case number calculations while assisting with control activity planning. provincial malaria control programmes, which actively investigate malaria cases and their contacts in the provinces in which malaria transmission occurs. The first two groups are the best served in terms of quality assurance, because many of them comply with accreditation requirements that include participation in PT schemes. Despite this, when viewed collectively, many of these laboratories perform sub-optimally. Malaria control programme microscopists have not participated in these schemes, but there is other evidence that a substantial proportion do not meet minimum quality requirements (NICD, unpublished report). Microscopy of stained blood films is considered the gold standard for the routine laboratory diagnosis of malaria. [9,48,49] Microscopy offers some advantages over RDTS, namely, the ability to detect the full malaria species spectrum, to quantitate the parasite burden (for prognostic value), and to serially monitor the parasitological response to treatment. The competency of microscopists is therefore crucial for accurate diagnosis. In SA, microscopists employed to perform malaria testing (often among other work) are usually medical technologists. Standards of training and proficiency of microscopists is highly variable. Malaria species identification is difficult, requiring expert training and much experience to master. Considering all these factors, and the findings from reviews of diagnostic quality[13,51,52] leads one to conclude that, unsurprisingly, the quality of the results from our laboratories is inconsistent. The provincial malaria control programmes do not necessarily have strict qualification criteria in place for employment of microscopists and as a result their competence is even more variable, as recently assessed (see next paragraph) (NICD, unpublished report). Additional training is planned to address deficiencies at this level of the health service in the near future. The NICD conducts training on diagnosis of blood parasites for routine laboratories, focusing on malaria. These training courses were previously limited to the NHLS laboratories in the central region of the country but from 2009 were extended to centres in all four NHLS regions. The main purpose of these courses is always practical microscopy but theory and practical components are also addressed. A limitation of this form of training is that there is no certainty that the course participants will return to their laboratories and implement the new techniques learnt, especially malaria identification. Some provincial malaria control programmes used to provide formal microscopist training, backed with regular refresher courses and a slide re-checking system to monitor quality, but this is no longer done. In 2012, at the request of the NDoH, two refresher courses were run at the NICD specifically for control programme microscopists (NICD, unpublished report). Private laboratory groups include some malaria microscopy in the course of general laboratory training, including some refresher courses (J Trusler, personal communication). However, there are no dedicated malaria microscopists in these laboratories and they are not involved in active surveillance. Ideally, standardised training, competence assessment and certification, as recommended by the WHO, should be made available to the whole spectrum of laboratories, public and private, that are involved in malaria diagnosis. In the past decade there has been a drive towards accreditation of medical laboratories. This process confirms that an adequate quality system is in place, to ensure accurate patient results. Accreditation ensures that laboratories use both internal and external QC. It also checks that adequate equipment and competent personnel are available. While the benefits of accreditation are numerous, the process to achieve accreditation is cumbersome and requires commitment from management and staff. With regard to public laboratories in our country, quality managers and coordinators have been recruited to implement and monitor quality systems in all laboratories. The process is ongoing, with regular audits conducted to check progress. The private laboratories follow a similar direction. The provincial malaria control programmes however, are lacking in this regard and require a great deal of support to strengthen their quality systems. Plans have been developed to support capacity strengthening of microscopists within malaria control programmes. It is recommended that all blood films be examined by two microscopists; however, in instances where this is not possible more lenient criteria should be permitted. As a form of confirmation of results, some laboratories check all positive results microscopically; others confirm positives with a confirmatory test such as RDT, PCR or quantitative buffy coat (QBC) and some have no checks in place. As mentioned, centralised checking was done within the malaria control programmes in the past but is no longer done. It is evident that staff in many laboratories that use RDTs as a confirmatory test for microscopy tend to favour RDTs over microscopy, as they fail to understand the limitations of rapid tests. In some instances, stained blood films are not even viewed, a major quality deficiency in the system. National guidelines stipulate that all laboratories that offer malaria testing in the country participate in a suitable external quality assessment (EQA) programme. In 1987, the South African Institute for Medical Research (predecessor of the NHLS and NICD) started an EQA programme for blood parasites, which the NICD currently administers. [50-52] This programme targets the SA public sector laboratories, but any laboratory may participate. The programme assesses laboratories' ability to correctly identify blood parasites (primarily malaria), to quantitate P. falciparum parasites on thin blood films, and occasionally to carry out relevant techniques such as slide staining or performing an RDT using a simulated blood sample. The national reference laboratory that conducts the programme belongs to an international EQA programme and is accredited to ISO standard 15189 (medical laboratory). The EQA programme was accredited to ISO standard 17043 (PT provider), by the South African National Accreditation System (SANAS) in early 2013. Participation in this programme by NHLS routine diagnostic laboratories is compulsory. There is also extensive voluntary participation by regional and private laboratories, but none from the malaria control programmes. Participation in such EQA programmes is not restricted to accredited laboratories and can be a key to identifying weaknesses in the quality systems of laboratories. A review of performance in the EQA programme over a 7-year period (Fig. 1) showed a 66% average rate of acceptable results (scores of 3 or 4 out of a maximum of 4 per challenge, i.e. ≥75%), excluding the non-responders. This means that on average, one third of laboratories are providing substandard malaria testing - not ideal for a country planning to eliminate malaria. There was wide variation in performance between surveys but unfortunately, no general trend towards improvement. To contribute to elimination of malaria in the country, three areas need to be addressed in terms of good quality laboratory diagnosis: (i) standardisation of methods, (ii) introducing and maintaining good quality systems, and (iii) improving the competency of malaria microscopists and RDT users. The first aspect has been undertaken by the NDoH, and has led the development of national quality guidelines for the laboratory diagnosis of malaria, soon to be deployed. The second aspect can be addressed by accreditation of all laboratories offering malaria training. Alternatively, quality officers could be employed to assist with monitoring of quality systems. Lastly, a solution to the competency problem would be to introduce a malaria microscopist certification programme.